The popularity of tile and hardwood floors has created a market for personalized custom rugs made for every room of the home. But if there is one area of the home that will benefit from both the attractive appearance as well as the floor softening abilities of custom area rugs, it is the baby’s nursery or kids' bedrooms where tumbles are a fact of every day family life. I find the thought of a toddler learning to walk with nothing between him or her and the hard floor but a diaper unsettling. And how awkward would it be for a mother or father to lie on the floor playing with their newborn with no padding? Certainly this situation would be so uncomfortable that the few dollars necessary to remedy the problem seems too cheap to worry about. You can pick up any old piece of carpet, put it on top of some pad and that will make the nursery floor much less threatening. So long as the shag or pile of the rug is clean and chemical free a remnant that you picked up for a deep discount will do the trick. 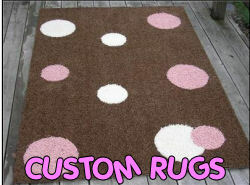 But for just a few dollars more, you can have personalized custom rugs made that will perfectly reflect the style of your custom baby bedding fabric, nursery theme or the color scheme of your kids’ bedroom. Round area rugs that take on the look of a baseball, soccer or basketball are super in a boy’s sports theme room and it is likely that you can find one ready made. But wouldn’t it be nice to have a personalized custom rug with your child’s name on it or a border that is a perfect color match to the bedding set rather than a generic sports theme rug? At the time of this article, the approximate price for a 4 X 6 custom area rug is less than $200 which is not too expensive for the decorative effect the floor covering is going to have on your kids’ bedroom. Did the announcement that you were having a baby catch you by surprise leaving you with a very limited nursery decorating budget? 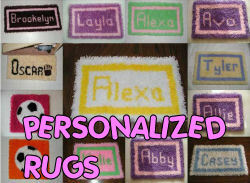 No problem, add a personalized custom rug to your list of desired gifts that you would love to receive at the shower and don’t forget to specify your preferred colors, the baby girl or boy’s name or monogram. If an exact color match is crucial, it might be a good idea to request samples. Before finalizing your order, always ask the vendor the fiber content and how deep the pile of your rug will be to be sure that the personalized custom rug is of the best quality. 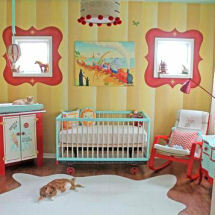 Return to find more baby nursery ideas and to see more examples of how you can use custom made rugs to decorate the floors of your kids' rooms in style.